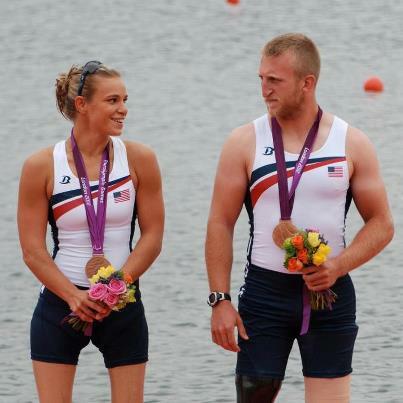 Athletes Without Limits is proud to have members of our DC-based integrated rowing team on the podium in London. The mixed double sculls crew of Rob Jones (Lovettsville, Va.) and Oksana Masters (Buffalo, N.Y.) won bronze in the Trunk & Arms category Sunday at the 2012 Paralympic Games in Eton Dorney, outside London. Theirs is the first U.S. Paralympic medal in this event since rowing became part of the Paralympic Games in Beijing in 2008. The U.S. crew was in sixth place at the start, but worked it’s way through the field, crossing the line in 4:05.56 to edge out Great Britain by 0.21 seconds. China won gold in 3:57.63, with France taking silver in 4:03.06. Rob is a member of the Athletes Without Limits integrated program with National Rehab Hospital, which brings our intellectually & physically disabled rowers together to support and row together — total integration!